When you think of eating in Mexico, you may think of tacos, refried beans, and melted cheese, but that's not right! What you'll find in a Mexican restaurant north of the border has nothing to do with the food you will actually find in Mexico. Mexican cuisine was listed by UNESCO as part of the Intangible Heritage of Humanity for good reason, and discovering the food can be one of the great joys of visiting Mexico. Here are some resources that may help you decide where, when and what to eat on your trip to Mexico. Mexico's great diversity - topographical, biological and cultural - guarantees that its cuisine is extremely varied. You'll find vastly different flavors from one destination to another. These are a few of the best destinations to sample some of the great foods of Mexico. One thing you may notice when dining in Mexico is that meals are not necessarily taken at the time of day that you're accustomed to. When you're ready for lunch, Mexicans are still digesting that heavy breakfast they just had. Check out this guide to the various meals of the day and what time they're usually consumed. Here's an insider's tip: breakfast isn't just the most important meal of the day. In Mexico, it's also the most delicious. This is the perfect place to follow the old adage: "Eat breakfast like a king." although we're not sure about the rest of it. Here's a glimpse at what you can expect for breakfast in Mexico. Vegetarians contemplating travel to Mexico sometimes worry they'll have a hard time finding food they can eat, or communicating their dietary restrictions. Here are a few travel tips for vegetarians in Mexico to help you deal with these issues. Oaxaca is one of Mexico's foremost food destinations. The state's great diversity has added to the range of ingredients and methods of preparation. 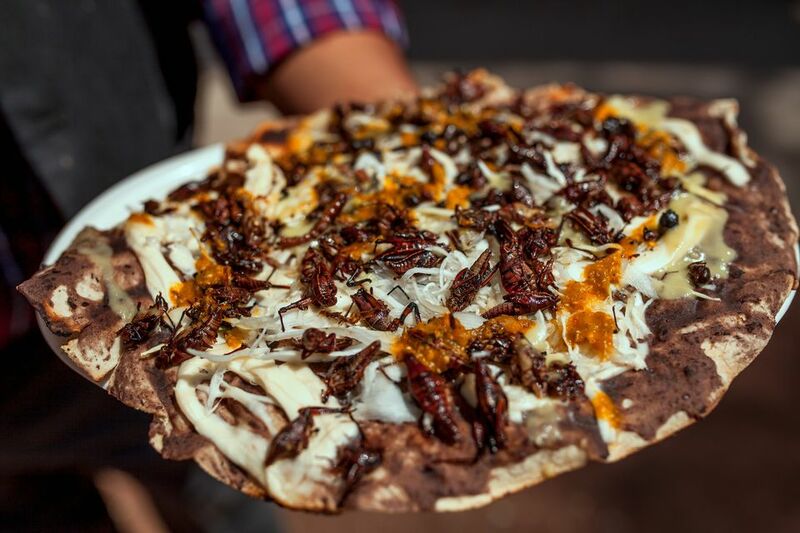 Here are some of the foods and drinks you can try on a trip to Oaxaca. The food of the Yucatan Peninsula is prepared with Mayan ingredients and using some special techniques. Find out more about the food of this region and some of the dishes you should try on a visit there. Another of Mexico's great food destinations, Puebla, is made up of a unique combination of indigenous, Spanish, and Arab influences, and the resulting cuisine is very compelling. Nuns from Puebla's convents played an important role in the development of several of Puebla's most iconic dishes during the colonial period, including chiles en nogada and mole poblano. Learn more about what to eat in Puebla. Some Mexican dishes are traditionally associated with certain holidays. If you're traveling to Mexico during Christmas or Day of the Dead, you should certainly take the opportunity to try some of these celebratory dishes. While you're enjoying all of Mexico's fabulous foods, don't forget that there are lots of interesting drinks to try as well. Of course, tequila and mezcal are way up there, but there are many others you shouldn't miss, including refreshing aguas frescas. Here's a list to get you started. When you're dining out you may be faced with the tipping dilemma: to tip or not to tip? and how much? Here are our tips on tipping in Mexico. It seems like it's impossible to replicate some culinary experiences. Is it the ingredients, the way they're prepared, or just the ambiance? We're not sure, but we do know there are some foods that just don't taste the same outside of Mexico. Is there a food that you love, and you just can't wait to get back to Mexico so you can have it again? Yes, that's the joy of eating in Mexico.